Pretty confident girl in formal outfit looking away with slight smile on face on background of city in sunlight. 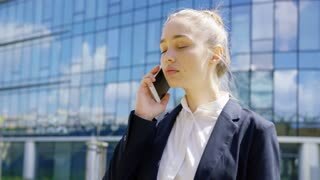 Confident young woman in formal clothing talking smartphone while looking away on background of city. Pretty young girl in casual outfit posing flirty in summer park and talking smartphone cheerfully while looking away. Confident pretty ethnic woman with long hair looking at camera with slight smile on tropical park background. Portrait of pretty black girl with rich curls looking away in dream on background of resort beach in sunlight. Confident black girl with curls wearing sportive top and strolling on street of tropical city in sunlight looking away. Pretty adult blond woman in sportive outfit looking confidently at camera on background of tropical city on shoreline of ocean.